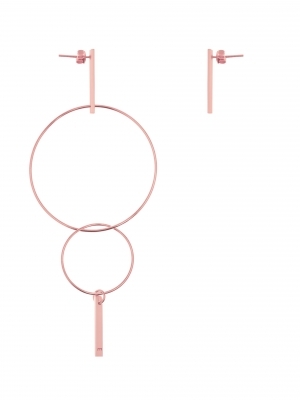 Symmetrical circle earrings. 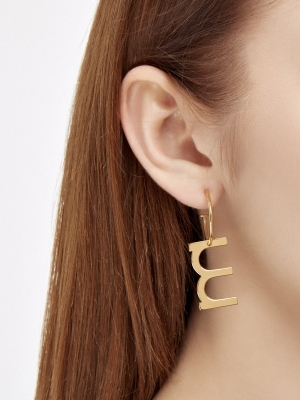 The shape of the earrings refers to the form of a vinyl record. Earrings are fastened with pins. The width of the earring is about 1 cm and the length is about 3 cm. Larger size of the earrings is also available in our shop. The product is made of Rose Vermeil gold. Symmetrical circle earrings. The shape of the earrings refers to the form of a vinyl record. Earrings are fastened with pins. The width of the earring is about 1 cm and the length is about 3 cm. Larger size of the earrings is also available in our shop. The product is made of Vermeil gold. Symmetrical circle earrings. The shape of the earrings refers to the form of a vinyl record. Earrings are fastened with pins. The width of the earring is about 1 cm and the length is about 3 cm. Larger size of the earrings is also available in our shop. The product is made of Silver 925. Symmetrical circle earrings. The shape of the earrings refers to the form of a vinyl record. Earrings are fastened with pins. The width of the earring is about 1 cm and the length is about 2 cm. Larger size of the earrings is also available in our shop. The product is made of Rose Vermeil gold. Symmetrical circle earrings. The shape of the earrings refers to the form of a vinyl record. Earrings are fastened with pins. The width of the earring is about 1 cm and the length is about 2 cm. Larger size of the earrings is also available in our shop. The product is made of Vermeil gold. Symmetrical circle earrings. The shape of the earrings refers to the form of a vinyl record. Earrings are fastened with pins. The width of the earring is about 1 cm and the length is about 2 cm. Larger size of the earrings is also available in our shop. The product is made of Silver 925. Symmetrical circle earrings. Earrings have a decoration in the form of evenly arranged balls. Earrings are mounted perpendicular to the ear. Earrings are also available in an asymmetrical version. Earrings are fastened with pins. Length of earrings: approx. 2.5 cm. The product is made of Rose Vermeil gold. Symmetrical circle earrings. Earrings have a decoration in the form of evenly arranged balls. Earrings are mounted perpendicular to the ear. Earrings are also available in an asymmetrical version. Earrings are fastened with pins. Length of earrings: approx. 2.5 cm. The product is made of Vermeil gold. Symmetrical circle earrings. Earrings have a decoration in the form of evenly arranged balls. Earrings are mounted perpendicular to the ear. Earrings are also available in an asymmetrical version. Earrings are fastened with pins. Length of earrings: approx. 2.5 cm. The product is made of Silver 925. Symmetrical circle earrings. Earrings have a decoration in the form of evenly arranged balls. Earrings are mounted flat on the ear. Earrings are also available in an asymmetrical version. Earrings are fastened with pins. Length of earrings: approx. 2.5 cm. The product is made of Rose Vermeil gold. Symmetrical circle earrings. Earrings have a decoration in the form of evenly arranged balls. Earrings are mounted flat on the ear. Earrings are also available in an asymmetrical version. Earrings are fastened with pins. Length of earrings: approx. 2.5 cm. The product is made of Vermeil gold. Symmetrical circle earrings. Earrings have a decoration in the form of evenly arranged balls. Earrings are mounted flat on the ear. Earrings are also available in an asymmetrical version. Earrings are fastened with pins. Length of earrings: approx. 2.5 cm. The product is made of Silver 925. Asymmetrical circle earrings. Earrings have a decoration in the form of evenly arranged balls. One of the earrings is mounted flat on the ear, the other one perpendicular to the ear. Earrings are also in a symmetrical version. Both earrings are fastened with pins. Length of earrings: approx. 2.5 cm. The product is made of Rose Vermeil gold. Asymmetrical circle earrings. Earrings have a decoration in the form of evenly arranged balls. One of the earrings is mounted flat on the ear, the other one perpendicular to the ear. Earrings are also in a symmetrical version. Both earrings are fastened with pins. Length of earrings: approx. 2.5 cm. The product is made of Vermeil gold. Asymmetrical circle earrings. Earrings have a decoration in the form of evenly arranged balls. One of the earrings is mounted flat on the ear, the other one perpendicular to the ear. Earrings are also in a symmetrical version. Both earrings are fastened with pins. Length of earrings: approx. 2.5 cm. The product is made of Silver 925. 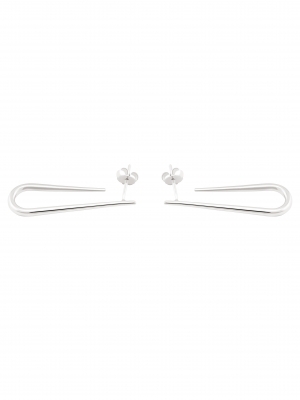 Asymmetrical “safety- pins” earrings. Earrings have a geometric decoration in the form of flat circles. Both earrings are fastened with pins. Length of earrings: approx. 2.5 cm. The product is made of Rose Vermeil gold. 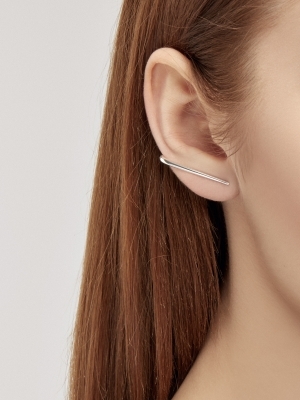 Asymmetrical “safety- pins” earrings. Earrings have a geometric decoration in the form of flat circles. Both earrings are fastened with pins. Length of earrings: approx. 2.5 cm. The product is made of Vermeil gold. 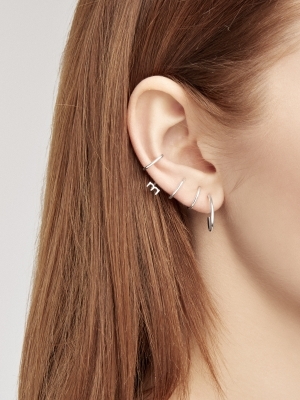 Asymmetrical “safety- pins” earrings. Earrings have a geometric decoration in the form of flat circles. Both earrings are fastened with pins. Length of earrings: approx. 2.5 cm. The product is made of Silver 925. Asymmetrical circle earrings. Earrings have a geometric decoration in the form of a construction with balls. Both earrings are fastened with pins. Length of earrings: approx. 3.5 cm. The product is made of Rose Vermeil gold. Asymmetrical circle earrings. Earrings have a geometric decoration in the form of a construction with balls. Both earrings are fastened with pins. Length of earrings: approx. 3.5 cm. The product is made of Vermeil gold. 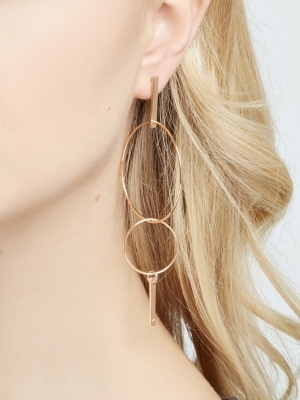 Asymmetrical circle earrings. Earrings have a geometric decoration in the form of a construction with balls. Both earrings are fastened with pins. Length of earrings: approx. 3.5 cm. The product is made of Silver 925. Necklace with a medallion hung on a delicate chain. The medallion has a written letter and geometrically finished edge. The necklace is available in three sizes due to the length of the chain: size S – 45cm, size M – 60cm, size L – 80cm. Choose the length that suits you best and create a composition with a few letters or various available medallions in different sizes. The medallion has a diameter of approx. 1.7 cm. Necklace is made of Rose Vermeil Gold. 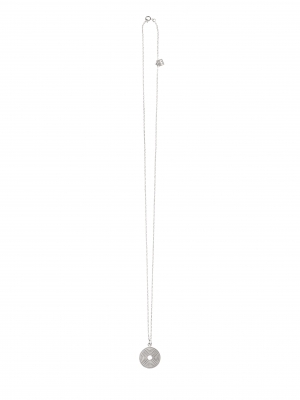 Necklace with a medallion hung on a delicate chain. The medallion has a written letter and geometrically finished edge. The necklace is available in three sizes due to the length of the chain: size S – 45cm, size M – 60cm, size L – 80cm. Choose the length that suits you best and create a composition with a few letters or various available medallions in different sizes. The medallion has a diameter of approx. 1.7 cm. Necklace is made of Vermeil Gold. Necklace with a medallion hung on a delicate chain. The medallion has a written letter and geometrically finished edge. 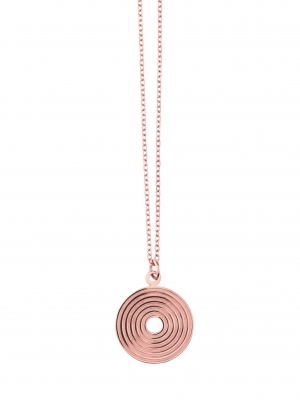 The necklace is available in three sizes due to the length of the chain: size S – 45cm, size M – 60cm, size L – 80cm. Choose the length that suits you best and create a composition with a few letters or various available medallions in different sizes. The medallion has a diameter of approx. 1.7 cm. Necklace is made of Silver 925. 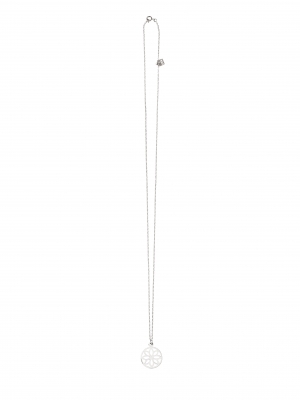 Necklace with a medallion hung on a delicate chain. The medallion has a geometric, harmonious form. 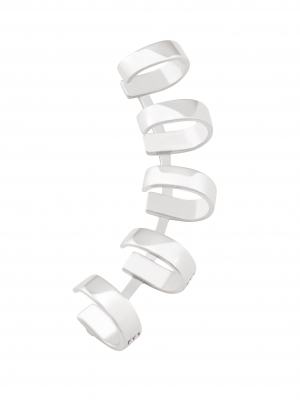 The necklace is available in three sizes due to the length of the chain: size S – 45 cm, size M – 60 cm, size L – 80 cm. Choose the length that suits you best or create a composition with several different designs of medallions in different sizes. The medallion has a diameter of about 2 cm. The necklace is made of rose Vermeil gold. The model in the picture wears size L.
Necklace with a medallion hung on a delicate chain. The medallion has a geometric, harmonious form. The necklace is available in three sizes due to the length of the chain: size S – 45 cm, size M – 60 cm, size L – 80 cm. Choose the length that suits you best or create a composition with several different designs of medallions in different sizes. The medallion has a diameter of about 2 cm. The necklace is made of Vermeil gold. The model in the picture wears size L.
Necklace with a medallion hung on a delicate chain. 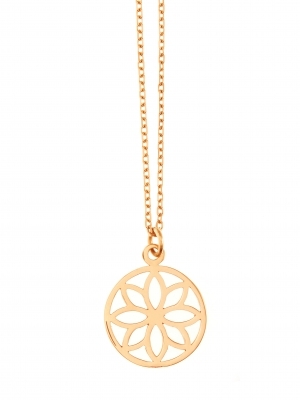 The medallion has a geometric, harmonious form. The necklace is available in three sizes due to the length of the chain: size S – 45 cm, size M – 60 cm, size L – 80 cm. Choose the length that suits you best or create a composition with several different designs of medallions in different sizes. The medallion has a diameter of about 2 cm. The necklace is made of silver 925. The model in the picture wears size L.
Necklace with a medallion hung on a delicate chain. 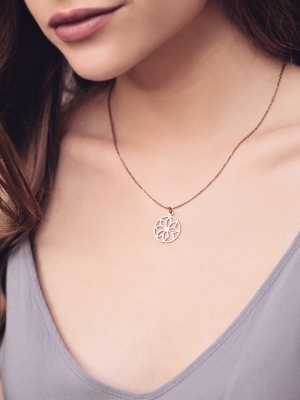 A medallion is in the form of an openwork motif with a geometric flower. The necklace is available in three sizes due to the length of the chain: size S – 45 cm, size M – 60 cm, size L – 80 cm. Choose the length that suits you best or create a composition with several different designs of medallions in different sizes. The medallion has a diameter of about 2 cm. Necklace is made of rose Vermeil gold. The model in the picture wears the size S.
Necklace with a medallion hung on a delicate chain. A medallion is in the form of an openwork motif with a geometric flower. The necklace is available in three sizes due to the length of the chain: size S – 45 cm, size M – 60 cm, size L – 80 cm. Choose the length that suits you best or create a composition with several different designs of medallions in different sizes. The medallion has a diameter of about 2 cm. Necklace is made of Vermeil gold. The model in the picture wears the size S.
Necklace with a medallion hung on a delicate chain. A medallion is in the form of an openwork motif with a geometric flower. The necklace is available in three sizes due to the length of the chain: size S – 45 cm, size M – 60 cm, size L – 80 cm. Choose the length that suits you best or create a composition with several different designs of medallions in different sizes. The medallion has a diameter of about 2 cm. Necklace is made of silver 925. The model in the picture wears the size S.
Necklace with a medallion hung on a delicate chain. The medallion has small openings giving it a shape reminiscent of a vinyl record with a hole in the middle. The necklace is available in three sizes due to the length of the chain: size S – 45 cm, size M – 60 cm, size L – 80 cm. Choose the length that suits you best or create a composition with several different designs of medallions in different sizes. The medallion has a diameter of about 2 cm. The necklace is made of rose Vermeil gold. The model in the picture wears size M.
Necklace with a medallion hung on a delicate chain. The medallion has small openings giving it a shape reminiscent of a vinyl record with a hole in the middle. The necklace is available in three sizes due to the length of the chain: size S – 45 cm, size M – 60 cm, size L – 80 cm. Choose the length that suits you best or create a composition with several different designs of medallions in different sizes. The medallion has a diameter of about 2 cm. The necklace is made of Vermeil gold. The model in the picture wears size M.
Necklace with a medallion hung on a delicate chain. 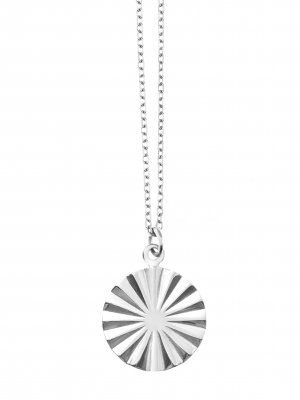 The medallion has small openings giving it a shape reminiscent of a vinyl record with a hole in the middle. The necklace is available in three sizes due to the length of the chain: size S – 45 cm, size M – 60 cm, size L – 80 cm. Choose the length that suits you best or create a composition with several different designs of medallions in different sizes. The medallion has a diameter of about 2 cm. The necklace is made of silver 925. The model in the picture wears size M.
Earrings in the form of asymmetrical pair of rings. 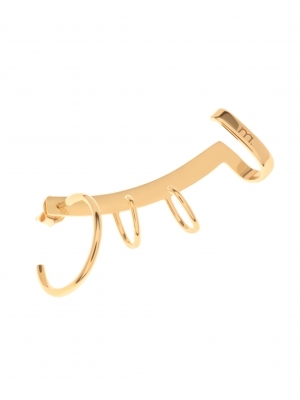 One earring consists of a large ring with small tag with ‘moie’ logotype. 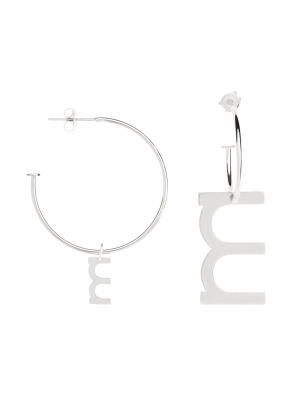 The second earring consists of a small ring with large tag with ‘moie’ logotype. Both earrings are worn as ear studs. Earrings are made of sterling silver. Both earrings are 5 cm long. 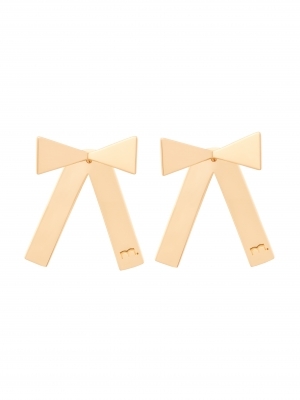 Earings made of yellow Vermeil gold. Earrings consist of a pair. 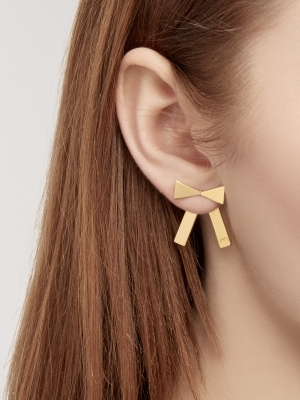 Each earring has two parts – that can be worn either as an ear stud with a bow or together with a ribbon mounted from the back side of the ear. Size of the earring: 2,5 cm. Earrings made of sterling silver. Earrings consist of a pair. 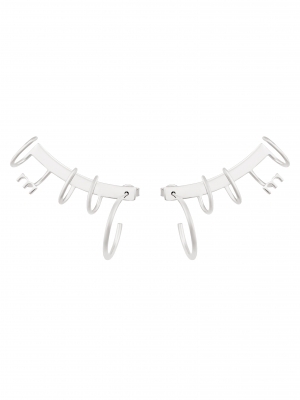 They can be worn either as ear cuffs or regular earrings. Size of the earring: 3,4 cm.